Let your big day shine with these new Foil-Pressed Save the Dates, exclusively at Minted. Real foil is hand-pressed onto the cards, leaving an elegant silver or gold leaf finish to create a truly unique Save the Date. They are available on both photo and non-photo designs. Designed by independent graphic designers from around the world, Minted currently offer 26 unique designs with more on the way! Click here to see more designs! From now through 4/9/2013, Enjoy 15% off save the date orders using the code 15APRST at checkout. There is no minimum purchase required for this promotion. Offer expires 4/9/2013 at 11:59 pm (PT). Wedding Paper Divas is offering an unbeatable deal just in time for all the Post-Valentine's Day wedding planning. You can get 10 free save the date cards between now and February 20th by using the promo code SAVEYOURDATE. Wedding Paper Divas is THE premium wedding stationery company and you can use them for all your wedding paper needs (wedding invitations, shower invites, reception stationery, thank you cards, and more. Check them out today and use the code SAVEYOURDATE to get your save the date cards free. You'll want to use them for everything! 9:00 am PT Friday, 1/11/2013. Since so many people are getting engaged this time of year, we wanted to share some save the date card etiquette and some of the newest save the date cards from Wedding Paper Divas. After you are engaged, one exciting step along the wedding planning process is your engagement photo session. It is great to have an engagement photo shoot because it allows you to get to know your photographer better, bask in all your love, and the photos are perfect for a photo save the date card or save the date magnet. After you are engaged and have shared the news with your close friends and family it is time to send out your save the dates. These are sent out in advance to notify for your guests of the upcoming wedding and give them time to make travel plans, especially if you are planning a destination wedding or holding the wedding on a holiday weekend. You should send your save the date cards around 6 months before your wedding and if it is a destination wedding around 8 months prior to the wedding. Since you are sending the save the date before the wedding invitation you have the opportunity to be fun and informal, even if your wedding is going to be a formal event. This is the chance to show your true personality and creativity and have some fun along the way! 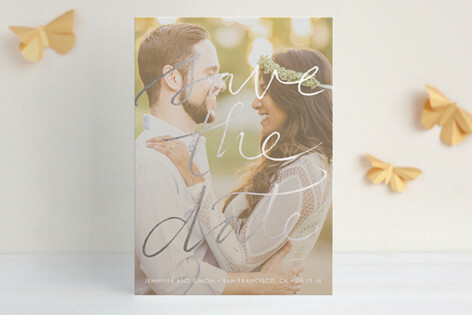 The most important thing to remember about a save the date card is that it shows your guests they will also be receiving a wedding invitation and will be invited at a later date. Etiquette states you cannot send a save the date card to someone and then not invite them to the wedding. Make sure you have time to work on your guest list before sending out these cards so no one will need to be “uninvited.” If you are not completely sure who will be on your guest list you can send your save the date cards to only your very close friends and family that will be attending for sure and later on send the wedding invitations to the other guests. This will ensure you are not committing yourself to any but your most important guests. Here are some of the newest save the date cards from Wedding Paper Divas. Which one is your favorite? Did you or someone you know got engaged over the holidays? Take advantage of post holiday sales! This week Wedding Paper Divas has two sales, both ending January 1, 2013 at 11:59pm PT. 1/1/2013 at 11:59 pm (PT). 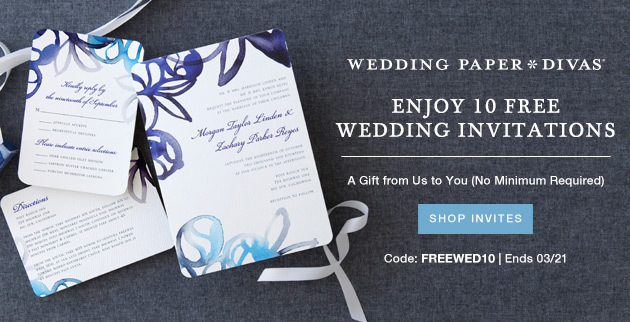 Save up to 25% off Wedding Paper Divas Invitations and Reception Stationery - Enjoy 10% off orders of $99 or more, 15% off orders of $199 or more, or 20% off orders of $299 or more using the code DECWED25 at checkout. Offer expires 1/1/2013 at 11:59 pm (PT). Enjoy ten (10) free save the date cards or save the date postcards using the code SAVEYOURDATE at checkout. Offer applies exclusively to save the dates from the Signature Collection and Signature Letterpress Collection and is not applicable to previously placed orders, shipping, taxes, rush processing charges, Save the Date Magnets and items from Thermography and Letterpress Collections . This promotion code cannot be combined with other offers. Valid for one-time use only. Offer is only valid on Wedding Paper Divas and is not applicable to third party or partner websites. To prevent abuse, we reserve the right to discontinue or modify this offer at any time without notice. We reserve the right to cancel any order at any time. Offer expires 12/10/12 at 11:59 pm (PT). ***UPDATE*** Coupon code is extended till Friday, December 14, 2012 at 11:59pm PT. Hurry and claim your 10 Free Save the Date cards (A $25.00 value)!